Looking for deals in Los Angeles? Set in Los Angeles in Hollywood, 200 metres from the Capitol Records Building, Kimpton Everly Hotel features a year-round outdoor pool. Great Hotel in Hollywood. Very good location, near many of the touristic spots. The Hotel is beautiful, staff is extremely helpful and friendly and it has a cool atmosphere. Coffee is complimentary in the morning and they serve a complementary glass of wine from 17:00 to 18:00. Plaza La Reina is located in Westwood Village, close to Beverly Hills and Santa Monica. This hotel offers guest rooms with free WiFi and valet parking. The Getty Center is 5 km away. We loved this hotel. Beautiful, clean and close to everything you need (trader Joe's, restaurants, coffee). The staff are helpful and polite. Situated in the heart of Downtown Los Angeles, LEVEL Furnished Living boasts an outdoor pool, a basketball court and weekly housekeeping. Each self-catering suite features free WiFi. The one bedroom suite was modern, spacious, clean and even though we were only on the 9th floor, we had great views of DTLA and the hotel's pool area. We enjoyed having our morning coffee on the balcony, although the street noise was a bit noisy outside. When the balcony door was closed however, the suite was amazingly quiet! 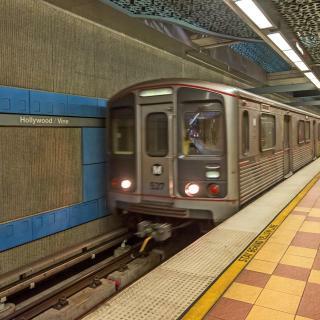 Level is well located and is an easy walk to the 7th Street Metro (which we used to get to Santa Monica on the Expo Line and felt perfectly safe), as well as Grand Central Market. We were also able to walk to The Broad and Walt Disney Concert Hall. The outdoor facilities at Level are fabulous with great poolside leisure seating and comfy BBQ/dining areas. We also enjoyed the Roof Top Cinema that we purchased tickets for (outdoor theatre at Level). The Sunset Marquis Hotel Los Angeles is located in the heart of West Hollywood. Hidden away in a tree lined cul-de-sac, it is just steps from the famed sidewalks of the Sunset Strip in West Hollywood.... Best accommodation I have had in all my peripatetic travels. This 5-star hotel is located on a residential street in Beverly Hills, within walking distance of Rodeo Drive. The hotel offers a rooftop pool, spa services and spacious guest rooms. The best hotel among those we visited in Los Angeles. El Royale Gardens Near Universal Studios offers accommodation in Studio City, less than 1 km away from Universal Studios Hollywood. Vincent and Robert were the only 2 people that we interacted with and they know and love their jobs! Homewood Suites By Hilton Los Angeles International Airport is located 0.4 km from LAX Airport via complimentary shuttle. Employees were helpful. Room was spacious. Hampton Inn & Suites Santa Monica is situated in the Santa Monica district in Los Angeles, 7 km from Getty Center and 13 km from Los Angeles County Museum Of Art. Great new hotel, right in the middle of everything, but just around the corner so not too noisy. Offering an outdoor pool and a fitness centre, Residence Inn by Marriott Los Angeles LAX/Century Boulevard is located 1 km from LAX Airport. Close to the airport, very clean and comfortable. Located 9 miles north of downtown Los Angeles, this hotel offers free parking. It offers rooms with a microwave, refrigerator, and free Wi-Fi. All as writen, no surprise except of nice front desk faces Great value for money and location. This hotel is 3 miles from Culver City and within a 7-minute drive of Venice Beach. The hotel offers a seasonal outdoor pool and rooms with microwaves. Our room was very comfortable. Providing free WiFi, New Seoul Hotel is situated in Los Angeles. In a prime location in the Koreatown district, this hotel is located 2.5 km from L.A. Live. Staples Center is 2.7 km from the property.... Staff was courteous and helpful. Room was clean and well appointed. Boasting an outdoor pool, InterContinental - Los Angeles Downtown is situated in the Downtown Los Angeles district of Los Angeles. The property has an on-site restaurant and free WiFi throughout. The hotel room had amazing view of the city, room is very clean an shotel bed is very comfortable. Located in Downtown LA’s historic Giannini Building, the NoMad Los Angeles features several on-site dining options and a rooftop pool. Great customer service, awesome room, and beautiful decor throughout! Offering a tranquil outdoor pool and an on-site restaurant, Hotel Figueroa is located across the street from the LA Live entertainment complex, which is home to Microsoft Theatre & Staples Centre. Fantastic stay nearby the LA Lakers Staples Center. TLC Chinese Theatre is 15 minutes’ drive from this Los Angeles hotel. Guests have free use of the athletic club with fitness classes and an indoor pool. AWESOME CLUB, DIDN'T FEEL LIKE A CLUB, IT FELT LIKE A 5 STAR HOTEL. ROOMS ARE AWESOME. What hotels in Los Angeles are good for couples? These hotels in Los Angeles are highly rated by couples: Waldorf Astoria Beverly Hills, El Royale Gardens Near Universal Studios and The Beverly Hills Hotel - Dorchester Collection. What hotels in Los Angeles offer an especially good breakfast? For hotels in Los Angeles that serve up a highly-rated breakfast, try Four Seasons Hotel Los Angeles at Beverly Hills, InterContinental - Los Angeles Downtown and Casa Del Mar. How much does it cost to stay in a hotel in Los Angeles? On average, 3-star hotels in Los Angeles cost € 158.75 per night, and 4-star hotels in Los Angeles are € 202.07 per night. If you're looking for something really special, a 5-star hotel in Los Angeles can on average be found for € 502.73 per night (based on Booking.com prices). On average, it costs € 201.12 per night to book a 3-star hotel in Los Angeles for tonight. You'll pay on average around € 310.69 if you choose to stay in a 4-star hotel tonight, while a 5-star hotel in Los Angeles will cost around € 567.24 (based on Booking.com prices). 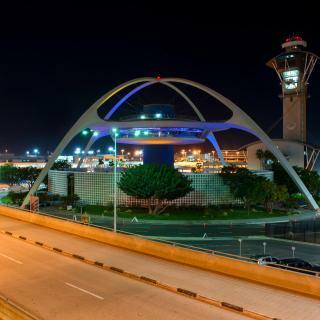 What are the best hotels in Los Angeles near Los Angeles International Airport? Travellers who stayed in Los Angeles near Los Angeles International Airport (LAX) have said good things about Hyatt Regency Los Angeles International Airport, Courtyard by Marriott Los Angeles LAX / Century Boulevard and H Hotel Los Angeles, Curio Collection By Hilton. What hotels in Los Angeles have nice views? InterContinental - Los Angeles Downtown, Waldorf Astoria Beverly Hills and Kimpton Everly Hotel have received great reviews from travellers in Los Angeles regarding the views from their hotel rooms. What are the best hotels to stay in Los Angeles? El Royale Hotel - Near Universal Studios Hollywood, The Beverly Hills Hotel - Dorchester Collection and Waldorf Astoria Beverly Hills are some of the popular hotels in Los Angeles. What are the best hotels in Los Angeles near Staples Center? 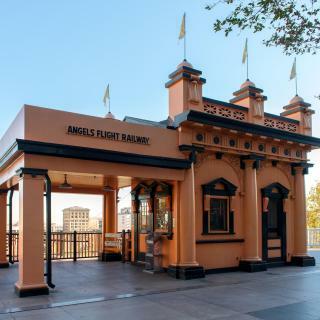 Some of the best hotels in Los Angeles near Staples Center include Luxury Apartment Near Staples Center, JW Marriott Los Angeles L.A. LIVE and Hotel Figueroa Downtown Los Angeles. Which hotels in Los Angeles are good for families? Many families visiting Los Angeles loved staying at El Royale Gardens Near Universal Studios, The Beverly Hills Hotel - Dorchester Collection and Viceroy L'Ermitage Beverly Hills. What is the best neighbourhood to stay in Los Angeles? 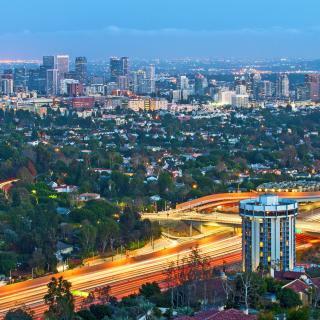 Koreatown, Fairfax District and LAX Area are popular with other travellers visiting Los Angeles. The average price per night for a 3-star hotel in Los Angeles this weekend is € 410.84 or, for a 4-star hotel, € 509.86. Looking for something even fancier? 5-star hotels in Los Angeles for this weekend cost on average around € 1,384.55 per night (based on Booking.com prices). Exploring Los Angeles, the place where many movies are made, you feel like you’re in a dream. Santa Monica Pier is the ending point of fabled Route 66, while just south is bohemian Venice Beach, lined by tall, swaying palms. Go slightly inland from the boardwalk to glimpse the canals that earned the area its name. Head north to the golden beach and stunning scenery of Malibu and see why movie stars over the decades have settled here. Also popular with the rich and famous are Bel Air and Beverly Hills, home to exclusive Rodeo Drive. And the reason for all this glitz and glamour? Hollywood, of course! Sitting high on a hill, the iconic sign is visible for miles around, while below the gold stars on Hollywood Boulevard immortalise celebrities of past and present. Be there on premiere night to see them grace the red carpet of Grauman’s Chinese Theatre. Over the hill is Universal Studios, offering behind-the-scenes tours as well as rides. Next door are the Warner Brothers Studios, and Paramount Studios are closer to Downtown LA. 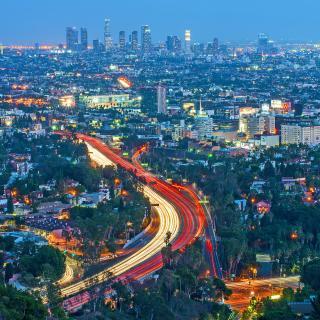 Whether you decide to live like a star in a luxury LA hotel or choose a cheap motel through Booking.com, it’s worth renting a car to get around this sprawling city and out to Los Angeles Airport (LAX). Diverse city. Have to walk along Hollywood boulevard to say you've done it but it's hard looking at the stars at the same time as the city. Venice boardwalk is cosmopolitan but not somewhere for the feint hearted the smell of cannabis permeates. A walk towards Santa Monica is very worthwhile. Plenty of things to see and do from Movie Studios, Beverly Hills, Rodeo Drive, Hollywood and Vine and much more. Santa Monica was fairly close with great beaches, bike rentals and just a fun place to hang out. LA is a city with lots of things to do for everyone. LA is a city with lots of things to do for everyone. Universal Studios were great and it took us one day to see all of it and do the rides. We’ve enjoyed Santa Monica Pier and the Promenade, the Griffith Observatory is an amazing place for picnics and to take pictures with the Hollywood sign. Don’t be put off by the homeless people you’ll see, there are lots but harmless. We did struggle to find a supermarket or a market to buy fruits / patisserie, expect to eat lots of fried food and burgers. If you are not into « celebrities «we do not think there is very much to do. Venice beach was extremely crowded and quite « bohemian Found it almost impossible to have a nice sit down lunch.Mostly crowded hamburger places. If you are interested in movie stars,singers,actors etc.. then this is the place for you. Also the weather is brilliant. LA is always a good idea. The location is absolutely fantastic! 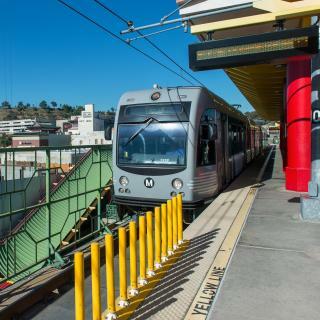 There is parking available for guests but the best thing is that you don’t need a car as the Metro red line station is literally only a few feet away and there is a bus stop right outside! This makes visiting most of Los Angeles very easy without worrying about traffic. The other good thing is that the hotel is within walking distance of the Griffiths Observatory which is about a 45 minute walk away so you don’t need to worry about parking. The hotel is clean and tidy and the beds were also comfy. I love the hotel location it’s just a walking distance away from the broad, grand central market and other good spots in DTLA, i was hesitant to book the hotel at first because of some bad reviews. good thing I didn’t change my mind because even if the room is not that big the place was clean and i think it was just recently renovated. The hotel location with a cheap price is the best! We stayed there for 4 nights, our flight is at 11PM and they allow us to leave our baggage the the front desk. Very friendly, helpful staff who make checking and parking a breeze, helping to manoeuvre our car out of a difficult park. Location was very central with a helpful shortcut through the mall. Staff were quick to warn us of any possible scams on Hollywood Boulevard and to reassure us of the safety of the area. Rooms were cleaned daily and the 24-hour coffee was s nice touch. Our room was massive and the kitchenette useful. One of the best and most pleasant hotels on our US trip. This place is the absolute BEST VALUE for downtown Arts District in LA. It is clean clean, secure, and in a great location. The shared bathrooms are close to the very well appointed rooms and are great. We are seniors who like to travel but have lost our tolerance for rustic cheap places. The staff are courteous and helpful. 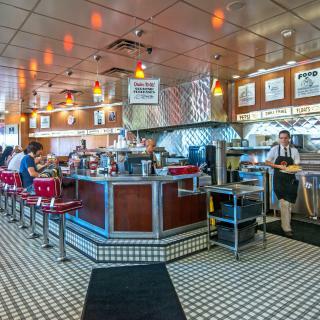 There are LOTS of very cool places to eat close by. This was our second stay here and for sure will come again. Booking reviews really well managed our expectation on the location or neighborhood... turned out not that bad, close to Hollywood/Beverly Hills, also a large supermarket right next to it. Room is newly renovated. Modern and comfortable. Good price compared to hotels at downtown or beach area and a short drive to many attractions. It was clean, the hotel was conveniently close to the airport and not too difficult to navigate to places in Los Angeles however it was a good distance from many places we would have liked to visit. The staff were very helpful though and we were helped to find great alternative activities and sights. Loved my stay. Would visit again. The staff was really friendly and helpful. We had nice conversations and the breakfast in the morning was okay, too. Enough parking lots in front and on the backside of the hotel. When you have a car it’s a good way to stay cheap in Los Angeles, but without a car you are far away from the beach. Nice restaurants around you. A lot of reviews here and elsewhere say the rooms are small and the area is bad. The rooms are fine and the area is no worse than anywhere else in Hollywood which is generally a dump. Good decor, nice rooms, decent facilities. Parking is $18 a day which is cheap for the locality. It was an excellent location close to Venice Beach providing easy drives to Hollywood, the Getty Museum and Universal Studios. Breakfast included was very good. Parking space outside the hotel was convenient and cheap 7 dollars as opposed to 20 inside the hotel parking lot. Wish a microwave was available but other than that I love this hotel it's quiet, clean, large, large comfortable beds without any pest control problems at all. Finally a great place to sleep and enjoy the best of Hollywood California. Good location to be not too far from downtown and other areas where concert venues. Its good for being near everything while not being too close to downtown area, where hotel prices tend to increase. Overall, great experience. Fantastic location in downtown and the beautiful building. Daily clean up was very good. The hotel staffs were friendly. We had a good time in Los Angeles thanks to you! Best bed ever from any hotel , best pillows , restaurant , bar , rooms are extra comfy . We are coming since 8 years only here for 3/4 night to hang around in Los Angeles . The hotel is immaculate inside. It has all of the mod cons, is clean and comfortable. This hotel is hard to beat when looking for somewhere to stay in Los Angeles. Room was beautiful and offered nice amenities, Hotel was co-located with major downtown area in walking distance from just about everything. The view from almost any floor over the Hollywood hills and downtown area is amazing. The view from the 73rd floor bar at night is the best. Location to the airport and price for parking was very cheap compared to surrounding areas! The location of this hotel is great! Close to airport, car rental companies and downtown. I don’t think the photos do the Chateau justice at all - it’s a hotel you have to breathe and experience. Truly I will never forget my stay. Everyone is beautiful but not intimidatingly so. The staff were down to earth and kind, completely lacked the pretentiousness you’d expect of a place with such notoriety. Plus - what can beat personalised stationary?